We’ve undoubtedly reached a point in American culture where there is an overcompensation of dealing with inequality. That’s not to say that equality isn’t a virtue that we should all strive for, but there is certainly a blanketing effect that demonizes those who have no horse in the race, which is ironically unfair. That’s what happens when someone is accused of being privileged because the subtext is that person should feel guilty about it. And an NBA star Kyle Korver just penned a piece about this subject and it’s dead wrong for a lot of reasons. You may not be familiar of Kyle Korver because he’s not an all-NBA household name but he is one of the best three-point shooters in NBA history. Maybe, top ten. 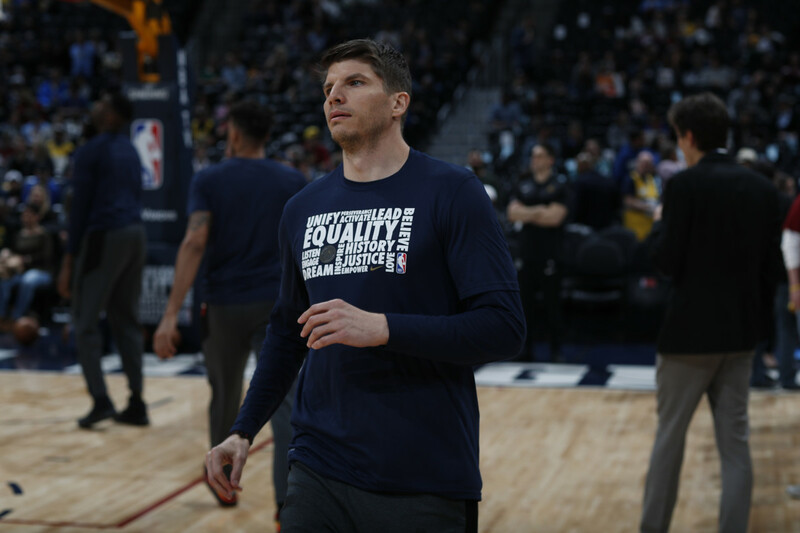 Korver wrote a piece called “Privileged” for “The Players Tribune” on Monday that made its rounds on social media and went viral. The scope of his writing deals with racism and privilege – giving multiple examples of how he’s guilty of assumptions about his minority teammates and colleagues. The tone being how he feels guilty for not seeing that earlier and for not doing anything about it until now. His first example was about his teammate Thabo Sefolosha whose leg was broke during an alleged altercation with police officers that consequently resulted in a season-ending injury. The alleged incident happened outside of a club late one night in the middle of back-to-back games and Korver’s first assumption was that Sefolosha must’ve been doing something wrong. Korver admitted it made him “cringe” to admit that. That ruling obviously vindicates Sefolosha. The next story he tells is about a month ago when the Oklahoma City Thunder were on the road at Korver’s Utah Jazz in Salt Lake City – Russell Westbrook got aggressive with a fan in the stands because he said that person was screaming racial epithets at him. No question that Westbrook’s claim is believable because that unfortunately happens all the time. That person was clearly in the wrong and most people – regardless of race – would’ve told him to shut up. Is racism inherent in some people? Of course it is, but it’s not like all white people need to be “woke” – be more consciously aware because most already do. The point though is that Korver crafts in a way that white people need to be better. We need to be more empathetic towards people of color who have experienced racism in America. The thing that’s so remarkably tone deaf is that Korver’s saying it as if not only is he the first to realize it but we all should follow his lead. The thing is; most of us already do that. When did we stop treating people from an “individual” standpoint? And if we all threw our hat in the ring and agreed with that sentiment then there would be zero racism in America. We should judge the individual for their actions and that’s it. Every race and creed has terrible individuals. Violence, thievery, rapists and murderers are not exclusive to a specific race or gender. Blanketing entire groups for the actions of a few is the very definition of anecdotal. Granted, he was young when he thought that but many black people also share that belief as adults because they feel – and slavery is certainly case in point – that white people have disenfranchised them from society since forever. But what he did was demonized an entire race instead of looking at it from an individual standpoint. It’s an unfortunate reality that his kind of ideology is either institutionalized or subliminally planted in brains at a young age. We failed as a society to not recognize the power of categorizing entire groups as all being the same thing. It’s simply false to even think that. Take for example Bill Maher, host of HBO’s “Real Time,” who has essentially said on many occasions that all Christians are stupid people for believing The Bible. He made a whole documentary called “Religulous” where he attacks Christians with “logic” to prove that that their faith is wrong. That it isn’t realistic. And those that are in the documentary are not exactly the most articulate and he purposefully used those particular people to fulfill his overall theme, which is to stupefy an entire religion. Cut to a couple of weeks ago – Democratic candidate Pete Buttigieg was one of his guests (forget about your political opinions on the Indiana Mayor for a second because that’s not the point) and he admitted to being Christian. Maher was beside himself because how could such a brilliant man who he admires believe in something as silly as Christianity? Maybe that woke him up a little bit. Korver’s “realization” is similar here too. What he recognized is that he was part of the problem in the way a pilot thinks that he caused maintenance-managed engine failure. Korver mentions after the Westbrook incident that there was a meeting held with players, coaches and the president of the Utah Jazz, to discuss the situation. He wrote, “In a closed-door meeting with the president of the Jazz the next day, my teammates shared stories of similar experiences they’d had — of feeling degraded in ways that went beyond acceptable heckling. One teammate talked about how his mom had called him right after the game, concerned for his safety in SLC. One teammate said the night felt like being “in a zoo.” One of the guys in the meeting was Thabo — he’s my teammate in Utah now. I looked over at him, and remembered his night in NYC. It’s important to note that Korver never mentions whether he’s ever been heckled or screamed at with racial epithets. Although, that’s probably true. Maybe not in an arena filled with tens of thousands but on the basketball courts outside that for sure. But then he gets to his theme, which is “This wasn’t the first time they’d taken part in conversations about race in their NBA careers, and it wasn’t the first time they’d had to address the hateful actions of others. And one big thing that got brought up a lot in the meeting was how incidents like this — they weren’t only about the people directly involved. This wasn’t only about Russ and some heckler. It was about more than that. And there it is. What Korver gets wrong here is that it IS exclusively about “Russ and some heckler” where the heckler was way in the wrong. Any other extrapolation is dangerous. And Russ absolutely should have defended himself that Jazz fan because that’s the only way to put that individual in check. Public shaming is unfortunately an effective tool to get people to rethink their behavior. Again, it’s anecdotal though. Is this happening at every single game? Nope. Is it more likely to happen in Salt Lake City Utah than in downtown Los Angeles at the Staples Center? Absolutely. Korver also offers up another caveat that defines the aforementioned, “There’s an elephant in the room that I’ve been thinking about a lot over these last few weeks. It’s the fact that, demographically, if we’re being honest: I have more in common with the fans in the crowd at your average NBA game than I have with the players on the court. Sure. Is that not okay? We all look different and Korver’s only justification is that in Salt Lake City Utah, it’s mostly a white demographic? Yes, that’ unequivocally true in that part of the country. Now, are people there more racist than in larger cities? Maybe, but that’s not proven and also anecdotal. Again, that depends on which part of the country you’re in but yes you’re more likely to see more white people at games in Portland, Oregon than in Miami, Florida. And racism comes in all forms from all different races. Korver never mentions if he has ever been the victim of what happened to Westbrook but the league is 75% players of color and there is no way that the white Utah Jazz three-point shooter never experienced that from his teammates or colleagues in all his years playing basketball. You don’t think that a black player took one look at him and preconceived the notion that he’s going to dominate Korver because he’s white? It’s the preconceived notion that black people are predominantly more athletically gifted. And it’s usually the case. That’s okay too. But if Korver read this he would probably point out that everything mentioned before totally misses his point. He also says, “But in many ways the more dangerous form of racism isn’t that loud and stupid kind. It isn’t the kind that announces itself when it walks into the arena. It’s the quiet and subtle kind. The kind that almost hides itself in plain view. It’s the person who does and says all the “right” things in public: They’re perfectly friendly when they meet a person of color. They’re very polite. But in private? Well….. they sort of wish that everyone would stop making everything “about race” all the time. There’s no question that what happened to Westbrook was racism. There’s no question that the white person who spouted off racial epithets towards Westbrook was racist. And Korver’s right that – not that Westbrook can’t take care of himself in that situation – any and all races should call out that person. We’re all Americans first and foremost.